Yesterday, though, I decided to delve into uncharted cooking territory and attempt another dish that my mom made often (far more often than she made sauerbraten) during my childhood: rouladen. 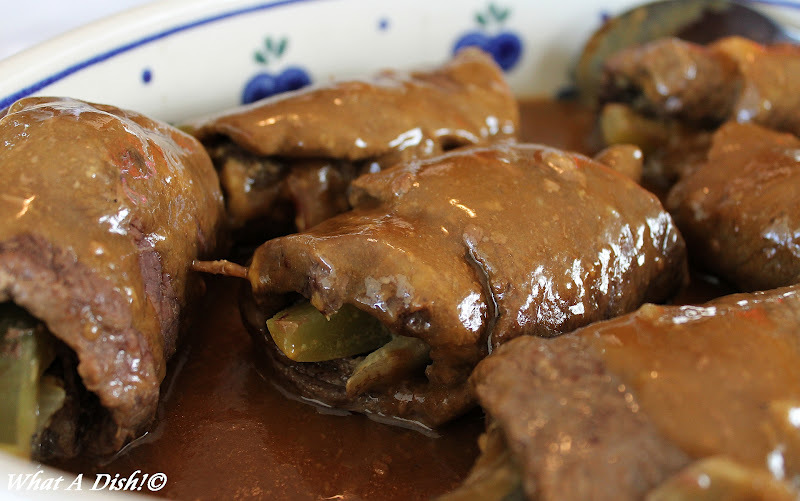 Rouladen usually consist of bacon, onions, carrots, mustard and pickles, wrapped in thinly sliced beef which is then cooked. …but I DO have photos of the process of making rouladen. If you have a realio-trulio German along to help you, it’s even more fun! Most importantly, you’ll need about two slices of thinly sliced top round per person, each piece about 3” x 7” x 1/4.” Our butcher sliced these for us and they were gorgeous! You’ll also need salt and pepper, German sweet mustard, bacon, onions (you can simply sauté them; I totally annihilated caramelized them), baby carrots or thin carrot slices, German pickles (“die Riesen” are unlike any American pickle, sort of a cross between sweet and dill. These were given to us by my dear friend Christel, also aus Germany!) and, for the gravy, beef broth, corn starch, and some sour cream. For each roulade, season the meat with salt and pepper, then spread some (that’s an official culinary term; it means “as much as you want) mustard onto the flat meat. And lastly, add a thin strip of pickle. What? You want a photo of the pickle added? Hmmmm. I don’t have one! You know why? Because either I totally forgot to add the pickle to this piece of meat or I totally forgot to take a photo when I did add the pickle! Fortunately I have a photo of when I added the pickle but totally forgot to add the bacon! Hey, just have fun with it! Yes, that’s my excuse. Speaking of fun, this is the fun part. Start rolling! Reminder to self: get some rouladen clips when we go to Europe in May (yes, I will blog that trip – I promise!). This must be when I started my second beer because I pretty much stopped taking pictures at this point. Once all twenty of our rouladen were rolled, we cooked them on high heat in our large electric frying pan, turning the heat way up to braise them and then down again to cook them until all pink in the meat was gone. …leaving the drippings in the frying pan. We then made a roux from the drippings, slowly adding beef broth and a little corn starch until it was gravy consistency, and then we poured gravy that over the rouladen. About 15 minutes before you plan to serve the rouladen, add about 1/2 to 3/4 cup of sour cream to the crock pot. To make it easier, I removed all the rouladen, stirred the sour cream into the gravy, and then replaced the rouladen. I wish I had taken photos of our plates filled with this deliciousness and of the whole “Mishpocheh” (look it up… in a Yiddish dictionary) enjoying each other’s company, but I am so out of blogging practice that I totally forgot! Which gives us reason to do this whole thing again sometime soon!